We’d been looking for a while for a good solution to keeping the chickens well supplied with fresh, clean water. Constant access to fresh water is a big factor in chicken health and egg laying. Delivering them water is one thing, but if you’ve ever kept chickens, you’ll know how messy they can be. Their natural scratching behaviour tends to foul up any water container with dirt, poo and anything else they can get their talons on. We’ve used refillable chicken waterers in the past but they have a few limitations: you have to refill them every day or two, they need regular cleaning, and most of them are translucent so you get algae growing in them eventually. So I wanted something that I could plumb in to the regular farm water system that feeds all our troughs to avoid refilling, but that would also stay clean and algae-free. I’d seen this design for sale on the internet for upwards of $80 and to my mind it just looked like a plastic box with a trough valve and holes. Given that I had almost all the parts in the workshop, I just needed to buy a big plastic box from The Warehouse. Price; $15. I drilled a hole and attached a spare trough valve so the water level would end up about 3/4 full and hooked it up to the water supply. When it had filled, I marked the water level, and just above that, I drilled the three large holes with the biggest hole saw I had – it just has to be big enough to fit a chicken’s head through. And that’s it. 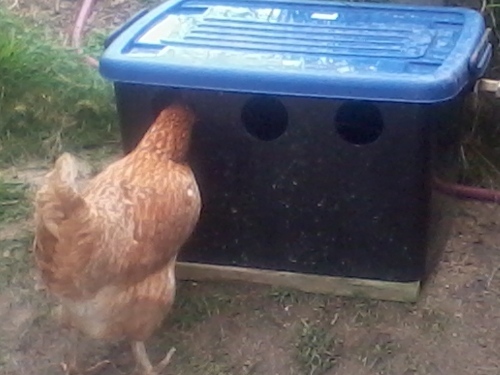 I left the lid off for a day so the chickens got used to drinking out of it (both out of the top, and through the holes). Now the chickens use it all the time. After a month’s test, the water is still pristine and algae-free. The high walls keep out all the grit and the solid plastic keeps enough light out that algae can’t grow. This easy project is proof that you don’t always have to spend a lot of dosh to solve farm problems. Nice simple solution, I remember the mess chickens can make from growing up. Nice work John. 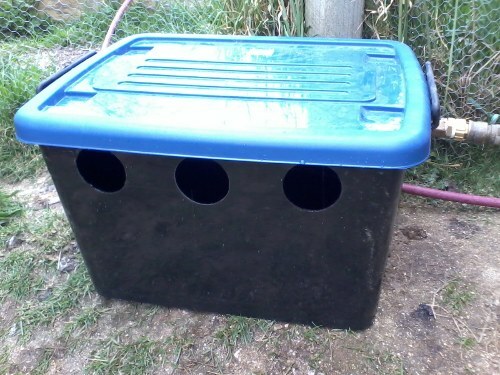 Dare I say, with a few modifications this box could be quite useful when it comes time to *ahem* harvest the chickens? I showed this to my husband who made it for my Xmas present. 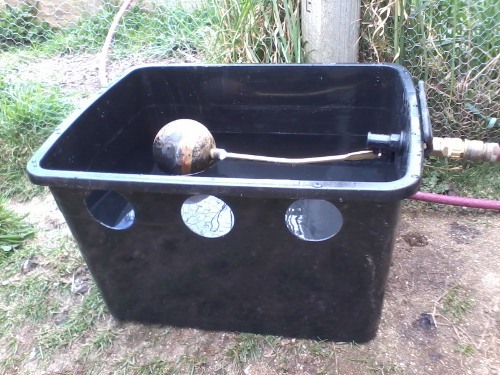 We have been looking for a watering trough for the chickens for some time as the waterer we used needed to be filled every couple of days and was growing algae. – the girls seem very happy with it, with this and the grandpas feeder we can now leave them for a few days at a time if we need to with only egg collection to keep the neighbours busy. I’ve been collecting the bits I needed (header tank, pipes, float valve, etc) for a little while now, and am just about to start building one of these. Are you still using it? How well is it working? Any additional tips to share?